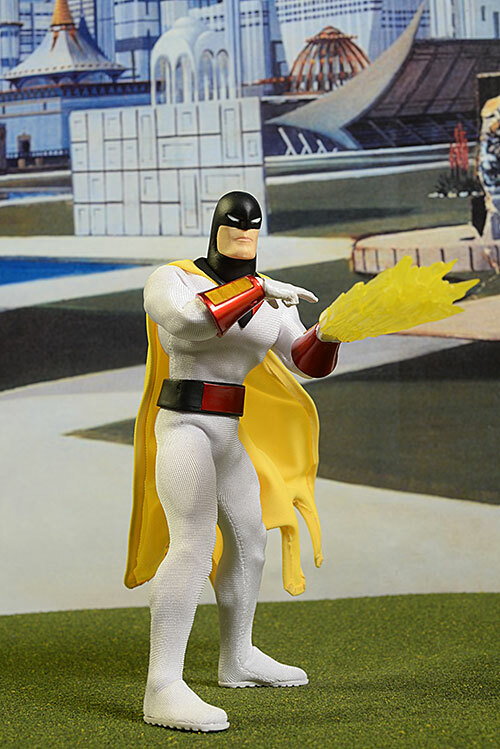 I'm a child of the 60's, and I was 5 years old when Space Ghost debuted on television in 1966. It was a goofy 60's cartoon, but even through the veil of nostalgia, I still see it as one of the better goofy 60's cartoons. Hit up YouTube and you can find any number of the old episodes for your perusal. One of the aspects I think I found particularly compelling, even as a young child, was the simplicity and clean lines of the costume design. It remains one of my top 5 cartoon/comic looks even after all these years. 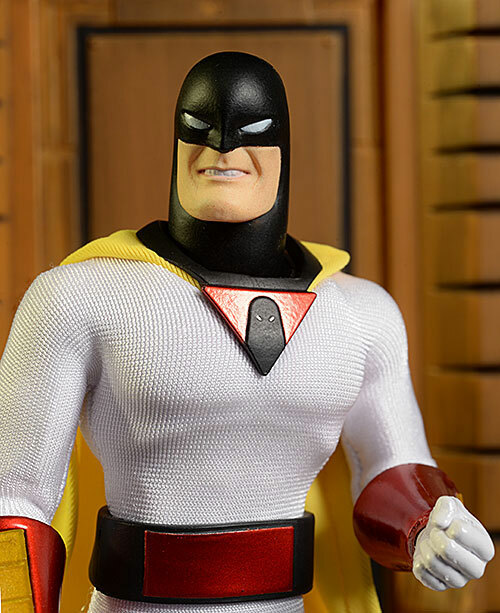 Mezco announced Space Ghost early on in the life of the One:12 Collective series, but it's taken awhile for him to come to fruition. The One:12 series is red hot right now, with early figures commanding big prices on the secondary market and new pre-orders selling out quickly. 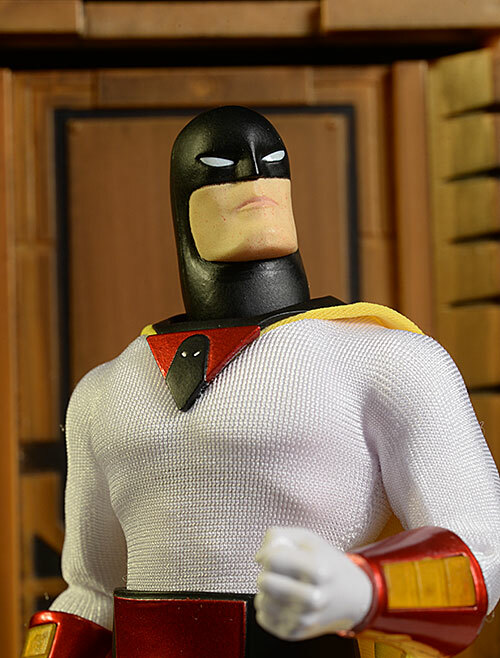 The costume design for Space Ghost is one that fits perfectly with the overall concept of the One:12 Collective, truly a match made in heaven. There's actually two versions of this guy - regular, whom I'm reviewing tonight, and a Previews Exclusive that glows-in-the-dark. 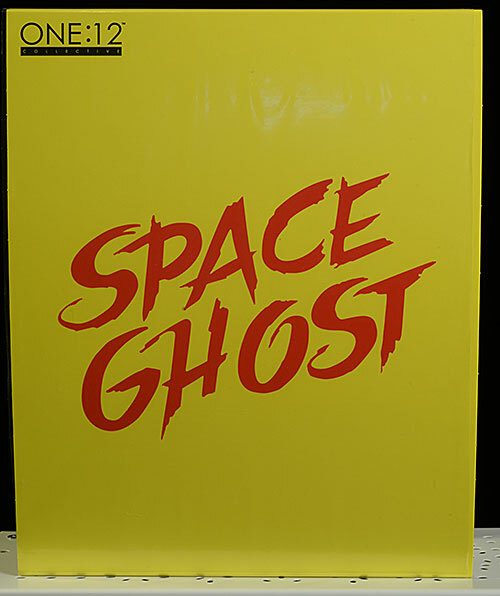 Expect to pay around $70 for this regular release, while the GITD exclusive is around $80 at most online retailers. They continue using the heavy, quality card stock for these boxes, a big plus. 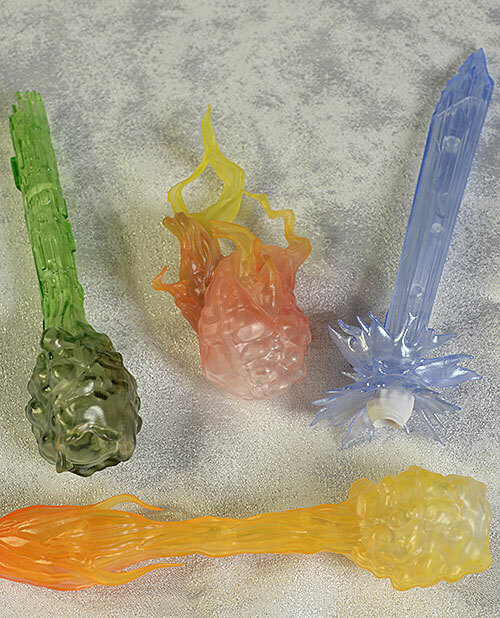 They're completely collector friendly too, and no damage is necessary when freeing the figure and accessories. The overall design is best described as spartan - the graphics and text are simple, clean, and straight forward. When I first pulled this guy out of the box, I was less impressed with the portraits (yes, there are two) than I had expected. Perhaps earlier One:12 figures had just set the bar too high, or perhaps my nostalgic love for the character created some bias. But I'll admit it, at first, I wasn't impressed. It's the shape that I think was throwing me off. It's weird. Then I watched some of the old cartoons over again, and you know what? He had a weird shaped head. This version is much more accurate than I thought, or at least as accurate as it can be to those old shows, where the look of the character could shift every frame, depending on who was drawing it. My feelings toward the standard, closed mouth portrait rose quite a bit upon viewing the show again. I still think that the neck is problematic, since the ball joint means the lower part of the hood can't widen out as much as it did on the show. But that's a minor nit, and one I can live with to get decent articulation in the neck. A big plus is the black plastic collar on the suit. This means that when swapping the heads, there's no catching the cloth collar in the neck. That can be an issue for some of the characters, like the Trek series or the Joker, but there's no issue here thanks to the smart design. In fact, if I were going off the single portrait, I'd go four stars here. It really did grown on me as I worked with the figure, and particularly after I re-watched the show. The second portrait brings the score down, however. This second version has an open mouth with gritted teeth. I suppose it's intended to be a 'battle' face, or what passes for Tad looking pissed. In reality, it looks like neither. Instead, he appears to be smiling in some weird way, as if he in a bad family photo with Jan and Jayce. It's not working for me, and sadly, will end up staying in the box. The hands work great, swap easily, and are sculpted for very specific purposes. More on that in the Accessories section. He stands about 6 1/2" tall, fitting in with the rest of the One:12 superhero line up nicely. Another round of excellent paint operations, considering the tiny scale. The trickiest area is the white eyes on the black mask. It's easy to have problems with these two colors, but neither portrait shows any real issue. The eyes look just a touch more squinted on the calm portrait, giving it another step up in my book. The teeth are really impressive on the scowling face, however. You can see clearly the gap between each, not easy considering the size. The problem isn't in sculpting, but rather in paint application, because often the paint is too thick or clumpy, and obscures small sculpt details like this. Not so here, and this is the sort of quality collectors are flocking to. My only real nit with the paint work is on the buttons for the power bands. They've given them a slightly worn look, and I'm not quite on board. It's a tough call - less wear might have looked more toy-like and less realistic, but the wear ends up also looking unintentional because of the overall cleanliness of the rest of the costume. Six to one, half dozen to the other. The underlying body hasn't changed, but this figure has some quirks. Let's start with the neck. While the mobility around the ball joint is good, the head pops off VERY easily. This can be a little frustrating, but fortunately it's easy to pop back on, thanks to the plastic collar that keeps the material out of the way. This does mean it's a little less mobile than some releases though, and it's not possible to get a great flying pose. The shoulders, elbows, and wrists all work fine for most arm poses, but this character has a very specific one that's not really doable. At times he would push the buttons on the arm bands, firing various energy beams (at other times both hands would fire, and no, I don't think there was any explanation as to why he had to push the buttons sometimes but not others). They give you the special hands with the two fingers extended, perfect for pushing said buttons. But unfortunately, the arm articulation doesn't really allow one arm to cross the body far enough to put the hand in position over the buttons, and still have the firing hand facing in a sensible direction. The rest of the articulation works great. The chest and waist can turn and tilt and hold poses even in the tight costume. The hips, knees, and ankles work great, allowing for deep stances while keeping the feet generally flat on the ground. All the joints are tight and solid as well, critical for keeping the energy beams aloft. Blip is highly articulated too, which was a surprise. With a ball neck and rotating hinge shoulders, elbows, wrists, knees, ankles, and hips, he can take a wide variety of great poses. 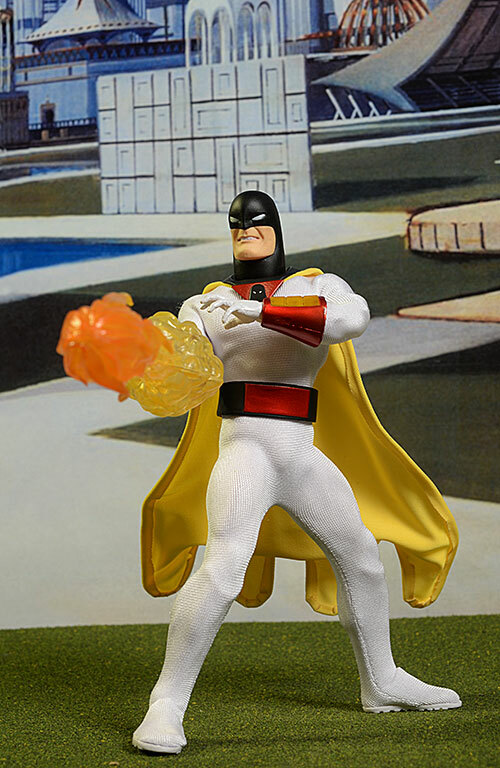 One last area of articulation - the yellow cape. There's a sturdy wire running around the entire outside edge, allowing for plenty of dynamic looks with any pose. This guy comes loaded, and the emphasis on accessories that we've seen with most of the One:12 figures is another huge selling point. As I mentioned earlier, there's two portraits. Getting a second head sculpt is always a plus to me, and it's standard practice for this series. The two do pop off quite easily, an issue I mentioned in the Articulation section, but it's a minor nit. The hands swap easily, but not too easily, and there's eight individual poses. He has a set of fists, a set of grasping hands, a set of flying (chop) hands, and a set of 'button pushing' hands. This final set has the two fingers extended. They all look great, and are properly scaled. There's three other hands actually attached to the various power beams. And there are power beams, oh there are power beams. There's a set of the yellow that he used most often, even in the intro to the show. Then there's a blue, icy, 'freeze' ray, attached to its own fist. On the flip side, there's two flaming bolts, one short (as though its concentrating around his hand, ready to launch) and one extended. These two don't have their own hands, and actually go on in place of hands, covering up part of the forearm. The last beam is a green energy bolt, also without its own hand. The ones that lack hands have a hole inside to pop the wrist peg into. His joints are tight enough to hold these beams aloft in various poses, and he can maintain a stance without toppling. My only real nit is what I already mentioned in the Articulation section - he can't really do a good pose touching the buttons with one hand and using the beam with the other. That would be enough to get four stars from me, but they've also included his monkey sidekick, Blip! 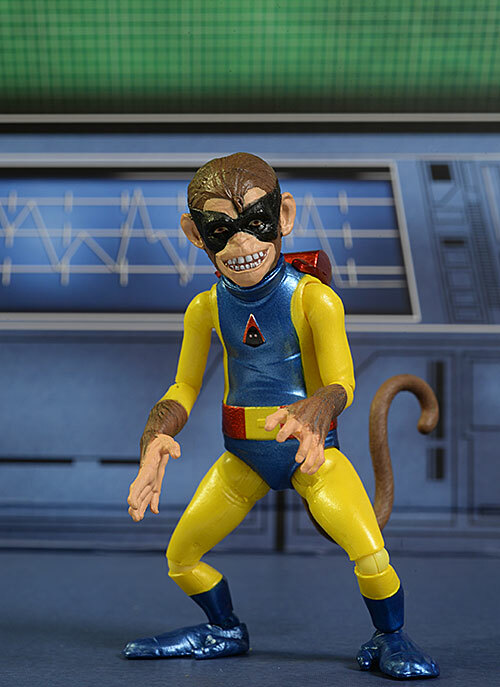 This is a large - about 3 1/4 inches tall - fully articulated figure. He has a ball jointed neck and rotating hinge wrists, elbows, shoulders, hips, knees, and ankles. The sculpt and paint work are terrific, although there is one quibble...he's awfully big. That's an unusual complaint - far more often, extra characters like these are undersized to save money. On the show, Blip was often up on his shoulder or around his neck, and when standing came in about knee height. Here he comes in at hip to waist height, depending on the stance. Finally, there's the usual round display base, complete with SG's logo and colors, and the clear plastic flight support. You can also just use a foot peg if you'd rather, and that's a great option. Mezco always provides a labeled plastic bag too, perfect for storing all the accessories if you toss the box. I mentioned earlier how much I love this simple costume design. Mezco has done an amazing job translating it to this scale. 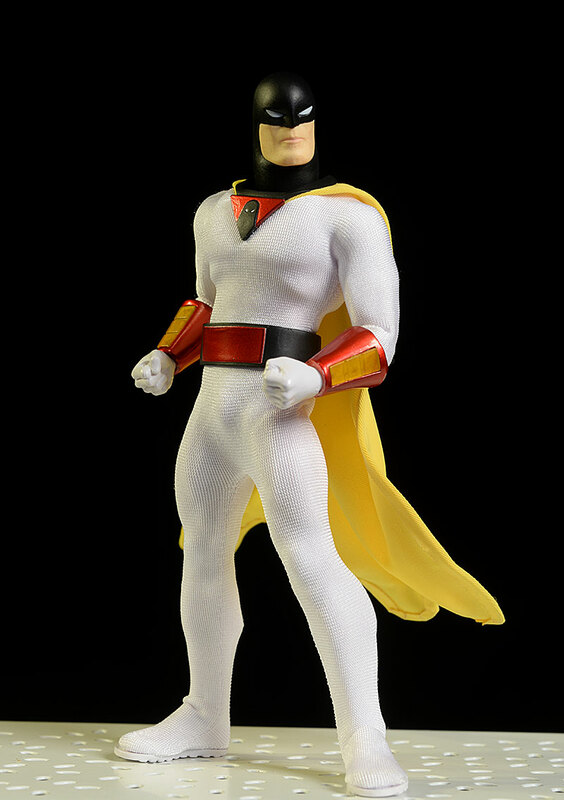 The soft yellow cape includes the wire for posing, and has the appropriate length and size. It's fitted perfectly to the shoulders, and looks great in just about any stance. The arm bands turn, and I realized too late that invariably I had them lined up differently on each arm in the photos. My bad. The belt rides a little high on his hips, but it's a minor nit. The body costume covers the feet, but there is a hard plastic sole. This means he can stand great, even in deep stances, and isn't slipping on the soft material. Perhaps the most important factor to point out - no crotch sag! 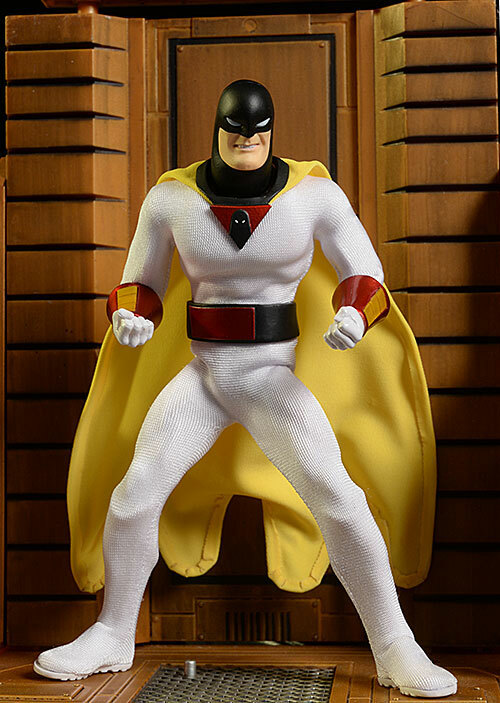 We saw this improve some with the Shazam figure, but here it's clear they heard the complaints with earlier body suits, and got rid of the 'diaper' look in deeper stances. All the One:12 Collective figures are a ton of fun. 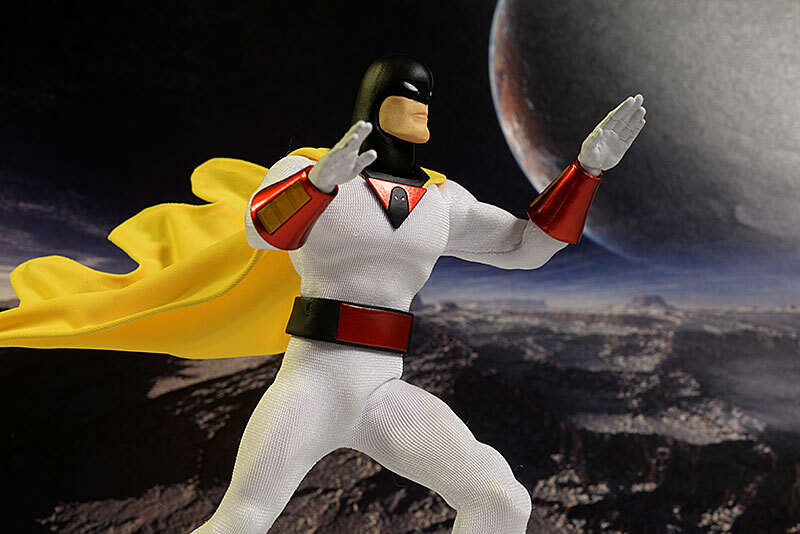 With solid articulation and a plethora of extras, you'll have a great time finding all the best poses for your display. This is a figure sturdy enough to survive normal handling without an issue, and by adding in Blip, you get even more potential display ideas. Remember, this is the $70 regular release, and you're getting a ton of extras, including the second portrait and a whole 'nother figure with Blip. I'm not saying it's a steal, but I don't feel bad about the price one iota. Not a thing. 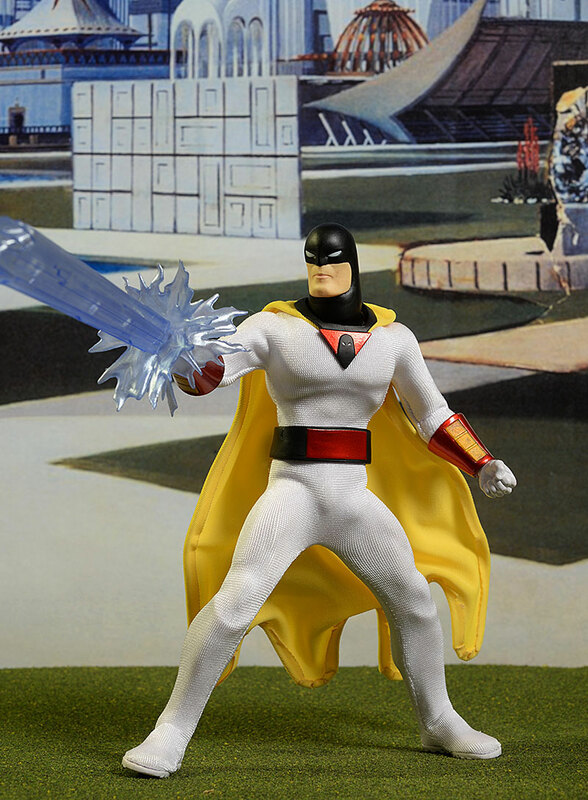 It's easy to work with the figure, and everything - including the energy beams - is sturdy and well made. 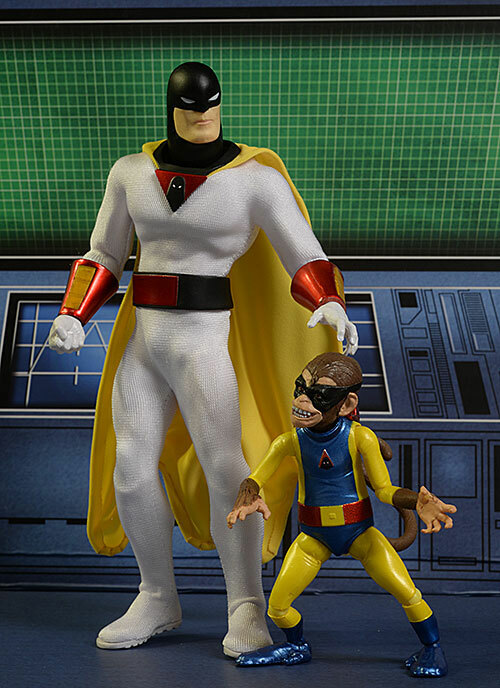 As a big fan of the original cartoon, I have to say this was one of my most anticipated One:12 Collective releases. While I'm not digging the second portrait, the original has grown on me, and the outfit and accessories are outstanding. I almost went four stars overall, but I realized that some of that was my nostalgia leaking through. I did have a few nits, enough to pull him down slightly. Still, fans will enjoy him, and if you loved Shazam, you'll love this guy. Improving the crotch issue is a big plus too, boding well for future releases. - still has the regular available at $70. - had the regular for $70, but appears sold out. You can still get the GITD exclusive for $80. - also has the GITD for $80. - Entertainment Earth has a great deal on the GITD version, where he's just $70, same as the regular release. Let's start with my favorite figure in the One:12 Collective - the Classic Punisher. There's also the regular release Punisher as well as their Toy Fair exclusive version of course. Other One:12 Collective reviews include Shazam, the classic Daredevil, the Flash and Reverse Flash, the BvS Superman, the comic based Joker, Green Arrow, the Frankenstein Monster Diorama, Frankenstein Monster, the BvS Batman, the Bvs Armored Batman, Captain America, Star Trek Kirk, the Mirror, Mirror and Cage variants of Spock, Sulu, the Toy Fair exclusive Spock, and the regular release Spock as well. Other One:12 Collective figures released so far include Dredd and his Lawmaster, the NYCC exclusive Judge Dredd, the DKR Batman and Mutant two pack, the Batman exclusives, and the initial DKR Batman. 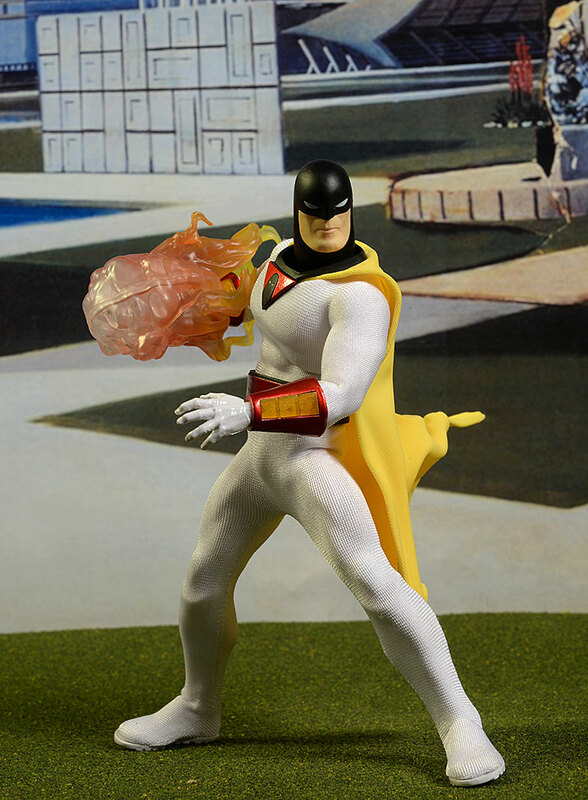 If you're just a fan of Space Ghost, check out the cool Coast to Coast figure from 17 years ago, the sidekicks from the show, as well as the much more recent but less exciting version from Jazwares.